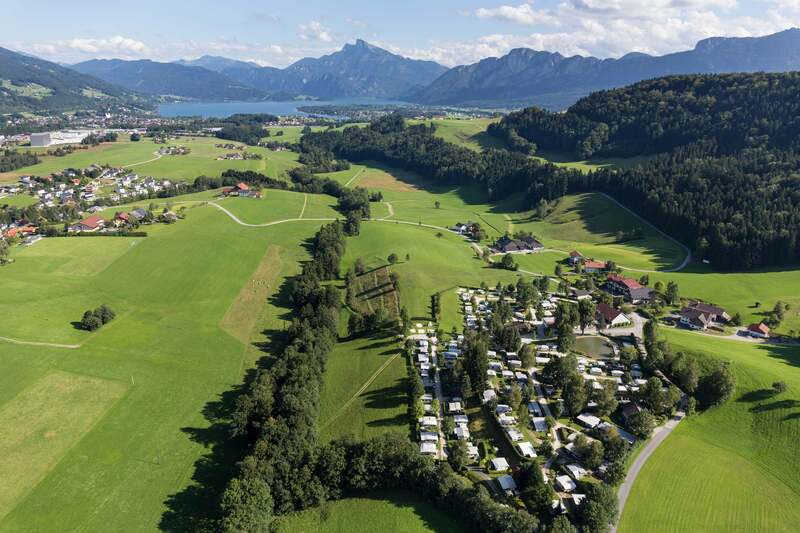 The camp Mondseeland is located between hills and mountains, next to farms and pastures, in picturesque surroundings and green secluded location. The view of the guests getting up in the morning leads directly to the mountain panorama in front of them. Particularly appreciated by our guests are our terraced pitches, from which you can enjoy a sweeping view of the entire camping area and the surrounding countryside. For this purpose, we have worked out a unique concept with our landscape architect, in which the individual pitches enjoy a majestic place with a view. With us one hears the grass grow. Nature lovers will get their money’s worth. The gurgling of the stream, the smell of earth and moss, the chirping birds and shady trees under which one likes to rest on hot days. Our generously landscaped pond where our premium pitches are located and in which you may like to be fished. Our resort is especially our specially created “Robinsontal” a quiet forest property where we have created fire pit, Holztipis and a walk for a special rest of our guests.